There are several reasons why a tooth can become discolored, such as staining, trauma, and age. 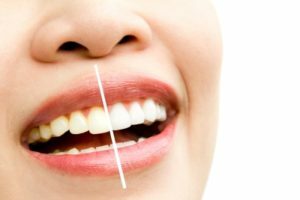 If you’re looking for ways to improve the appearance of a discolored tooth in Denver, then you’ll find that there are several ways to treat this type of dental problem. If you have a tooth that is discolored due to staining, then professional teeth whitening could offer you a solution. Teeth whitening is the most popular type of cosmetic dentistry procedure, and it can be highly effective on natural teeth that have become dull or yellowed in color. When you visit your dentist for teeth whitening, he will apply a bleaching gel to your teeth, and may also use a specialized light to enhance the whitening effect of the treatment. Many patients see a noticeable difference after a single, in-office whitening appointment. For individuals who have teeth that are healthy but chipped, cracked, discolored, or otherwise damaged, porcelain veneers are a popular solution. If you have one or more teeth that are affected by intrinsic staining, a darkened color, or patchy-colored surface, then custom-made veneers can be created to fit over the discolored teeth to make them appear bright and healthy. Porcelain veneers are extremely thin shells made from porcelain material that your dentist attaches to the front of your teeth to improve their appearance. Many patients end up looking for ways to improve the color of a tooth because they dislike the cosmetic effects of their silver amalgam fillings. Even if your tooth has only a small silver amalgam filling, this can mar the tooth with a gray tint, and the filling itself can be obvious when you smile or laugh. Luckily, there is a simple solution for improving the appearance of this type of discolored tooth. Your dentist can remove the silver amalgam filling from your tooth and replace it with a tooth-colored filling. This kind of dental restoration looks incredibly natural and is often indistinguishable from the natural tooth.